Less stress on payday, no more individual payment inputs. Set up payments from accounting and payroll software instead. Generate payment file from Xero or similar. Import, all industry formats supported including Bacs. Schedule pay run upon import in advance to be sent later. Also, set custom pay run approvals if needed. Fund your Telleroo account from your business bank account by sending one lump sum. No need to make payments on payroll day anymore, simply draft pay runs in advance and schedule payments for payday. Re-keying payment information and reference details is a nightmare and something no finance person should be bothered with. This high degree of manual processing is costly and slow, and it can lead to inconsistent results and a high error rate. We support Xero, Sage, Brightpay or similar file formats, no need to manipulate or reformat bankfiles to set up payments. Set up payments in advance to avoid any stress on payday, especially when dealing with multiple pay dates. Telleroo will chase payment authorisations for you, we get all relevant people informed about pay runs and will ensure everyone gets paid on time. Stop dealing with slow Bacs payment cycles, instant round the clock Faster Payments instead, meaning no cut-off times - all payments are immediate. We use google authenticator for verification, finally no more physical keyfobs to make payments needed. Our open API enables you to submit payments directly from your back-end, enabling you to build payment workflows independent of any human intervention. Check out our partnership program and see the benefits it brings to your clients. © HPillars Ltd trading as Telleroo. Company number 10175644. 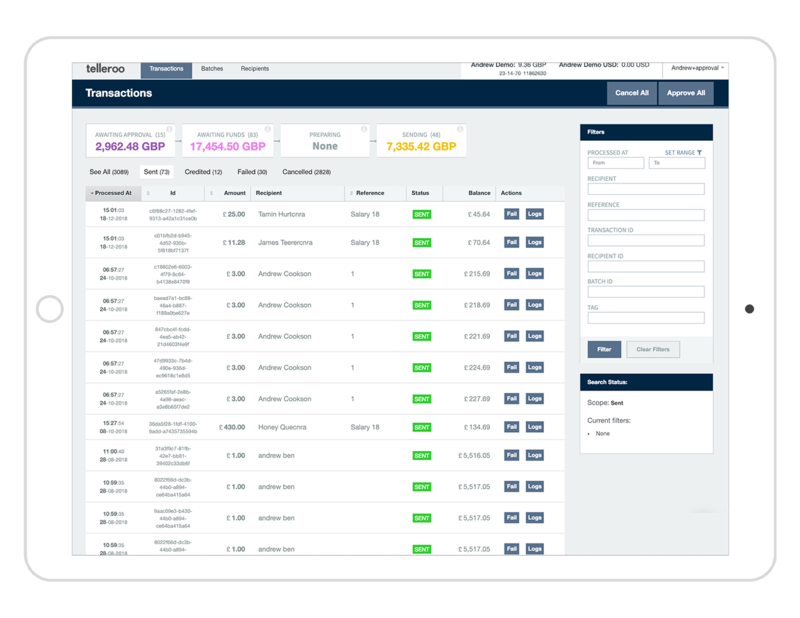 The Telleroo account is an e-money account provided by TransferWise Ltd.